The Grief Support Mailings is a comprehensive bereavement follow-up program for organizations. The Mailings come with a User Manual and an accompanying USB flash drive that contain a series of 12 compassionate Letters and a single-page Grief Educational Enclosure to accompany each Letter. An additional Enclosure, "Holiday Bill of Rights," is included to place in the October or November mailing. 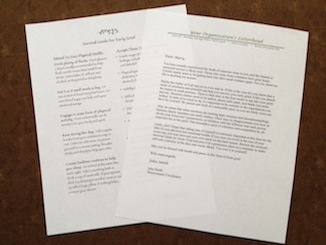 The Grief Support Mailings is an economical, high quality bereavement resource. 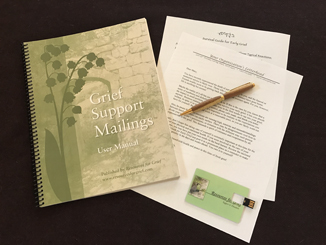 The purchasing organization is free to make as many copies of the mailings as needed for bereavement follow-up. In addition, the Educational Enclosures can be used for other purposes--as conversation starters on home visits or as handouts in grief support groups. A sample form is included to help you track the mailings. If you need a more sophisticated system to reduce staff time, consider our Grief Support Mailings Database. 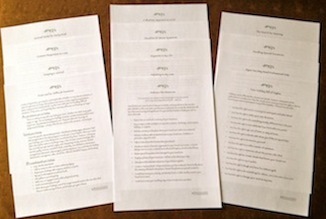 The Grief Support Mailings have been written with respect and sensitivity for religious, cultural, age, and gender differences. Also, many grief and loss professionals, as well as the bereaved, have reviewed them. You can use the Grief Support Mailings with confidence! The Grief Support Mailings, English version, is $225. For an additional $75, receive the Spanish version as well. 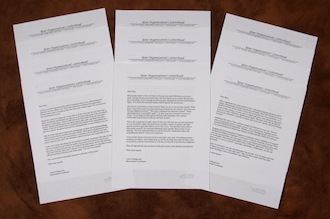 "We have just begun to use the mailings. They are well-written and we are glad to be making them a part of our bereavement care." "The Grief Support Mailings have been a great resource and I've had very positive responses from the recipients. This is an investment we want to continue." "I have heard several more reports that they were welcomed and spot-on with grieving family members! Thank you, Rebecca!!"